Update: Make sure you check out the new Super Google Reader Chrome extension. I have been a huge fan of Firefox and write regularly on that topic here. But, I have to admit that Google Chrome has been sneaking slowly into my workflow anytime I needed a second browser. Google Chrome is super fast to launch and browse but I hadn’t even tried to switch to Google Chrome because of lack of extensions support. Then, Google Chrome launched extensions and I told myself it will be a while to see all my favorite Firefox extensions to be available in Google Chrome. But I just noticed something HUGE! Google Chrome supports Greasemonkey Scripts natively without a need of extension. Basically, we have 40,000 more Google Chrome extensions in the form of Greasemonkey scripts. Just go to a Greasemeonkey script page and click Install. The script will install just like any other Google Chrome extension. If you are new to Greasemonkey scripts, they are community developed free scripts that extend the functionality of existing web applications, websites, etc. It’s estimated that about 15-25% of the existing Greasemonkey scripts may not work with Google Chrome. I personally feel this is a great milestone for Google Chrome especially in the eyes of Firefox fans like myself. 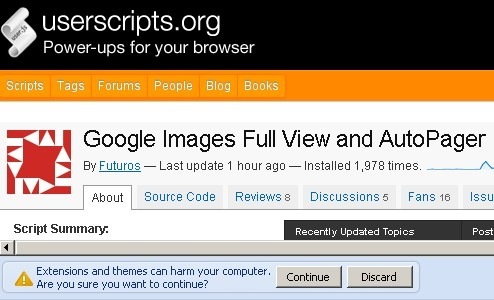 If you are a Firefox fan, would this woo you into giving Google Chrome a shot? Working with Greasemonkey scripts makes work more efficient. I use Google Chrome and has been trying to explore all I could about Greasemonkey scripts.